Unless you are a math whiz, it’s tough to talk about statistics, graphs, numbers and trends in English. Download the pdf to practice the vocabulary of numerical reasoning tests – one of EPSO’s favorite kind. Numerical reasoning tests measure your ability to analyze, interpret, and draw conclusions based on numerical data such as statistics. Numerical data in these tests is typically presented in various types of graphs, charts and tables. EU institutions and companies like to use numerical reasoning tests during the selection process because these tests are difficult enough to help them slash the large number of applications by half (at least). Here is a not too difficult numerical reasoning test – good luck! You will need to work fast – the time limit is 5 minutes! 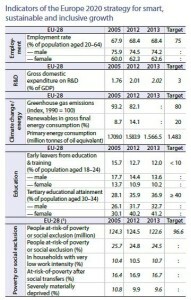 The EU2020 target for expenditure on research and development is set at ……………………. of the GDP. The EU2020 target value for greenhouse gas emissions is ………………………… of what it was in 1990. In 2005 almost _______________ of the male population was employed. 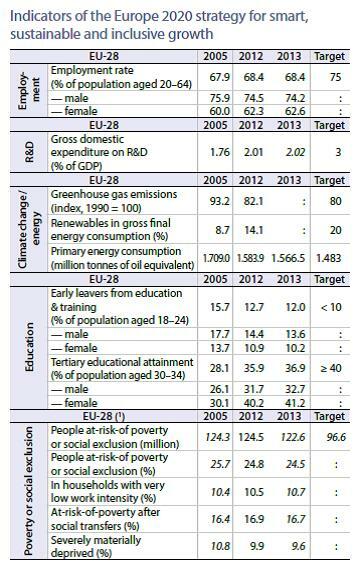 In order to reach the EU2020 target in terms of employment, the percentage of the working female population aged 20-64 has to go up by ……………………………… . Between 2005 and 2013 the percentage of the female population with a university or college education has risen by …………………………………… .